Today I came upon this scene. I was the second person there. There was still smoke and dust in the air and a lady was staggering around the road half crying and completely in shock. After asking if anyone else was in the car, I grabbed her and helped her sit down. Then I held her. I put my arm around her shoulders as she sobbed. After a few moments I moved over to check the car. She was right. No one was in the car. She was lucky she didn’t die. 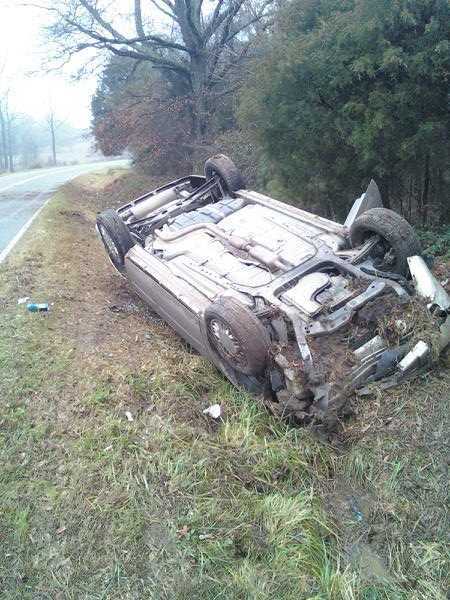 She wasn’t wearing a seatbelt and the drivers side was crushed. She crawled out the passenger side window and back into life. Moments earlier she had been cruising down the road surely not thinking about having a stare-down with death. She was consumed with life. She was on her way to somewhere to meet someone to do something. None of those things are important now. The only thing that is important is that she gets another day. One more day. Her life will never be the same. She will always look back on today as “That day.” That day when I almost died… but I lived. Have you had an experience like this? A day where you should have died, but you lived? What has happened in your life since that point? Have you lived life to its fullest or are things virtually the same? Have you had a “That day” experience? We’d love to hear it. I had a similar experience, memorial day weekend this year (’09) 2 am or so on my way home from work I notice a car in the middle of the median grass with its lights on, since there isn’t much help around at 2 am I stop, back up, and park. as soon as I got out of the car I knew something was wrong, as music was blasting from the car in the grass, if you are in a crash you would kill the radio first. Since I am an airplane mechanic I always carry a flashlight on my belt, I shined it across the highway to the other side and saw a body lying in the road! Yup–have definitely had a few ‘that day’ experiences. Then the questions–‘Why?’, ‘What if…?’, ‘Now what?’ Yes, life perspective changed at those moments, but just as important, revisiting those times continues to affect & influence.